Utopia, the UK’s largest supplier of tableware and glassware for the hospitality industry, has seen its market share grow substantially in 2018 and the start of 2019, both at home and overseas. To keep pace with these rapidly increasing sales the company has moved to a new 168,000 square foot warehousing and office facility at Langham Park near Chesterfield. This takes Utopia’s total investment in expanding its business to over £15m during the last six months. The capacity of the new warehouse is more than three times greater than Utopia’s existing warehouse. 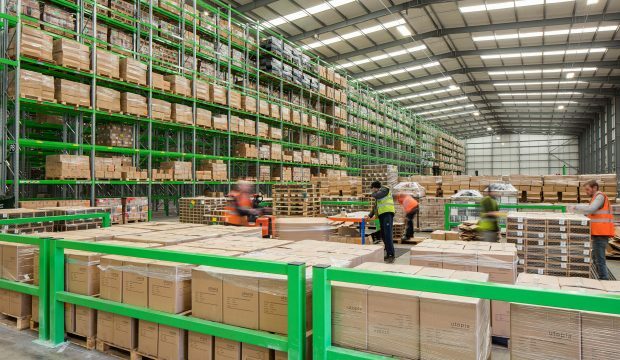 This allows the company to hold in excess of 30,000 pallets under one roof, preventing the double handling of goods and giving constant visibility of all stock. With 15 dock levellers there will be no need to unload containers outside, bringing benefits in terms of speed, less damage to product, and a better and cleaner working environment.